Stop Meowing and Go the F*ck to Sleep is a funny take on the frustrations of losing sleep because of a feline friend. This book looks hilarious and we think cat lovers will get a serious kick out of it! Our kitty CEO is a bit of a night owl, and when she’s not on social media or writing her online diaries, she likes to sing loud renditions of the songs of her people and reenact her favorite ninja action scenes whilst her human servants try to get some rest. This book definitely hits close to home. Rosa Silva is an author and blogger. When she’s not working on her next book, you can find her reading, chilling on the beach, hanging out with her cat, or writing the next post for her blog Cat Lady Confidential. 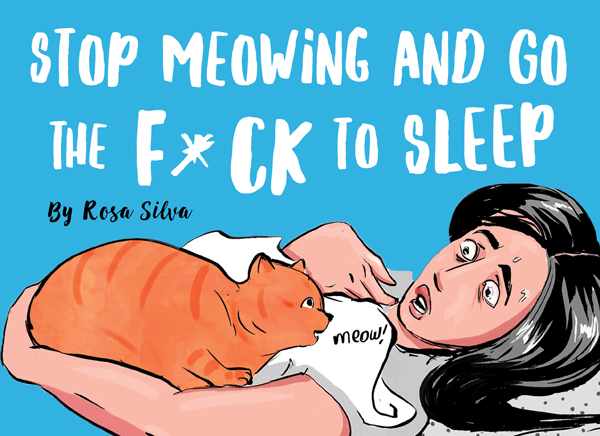 Stop Meowing and Go the F*ck to Sleep is her first book. You can order a copy on Amazon for $9.99 . Check it out and share with us what you think! Do you let your cats sleep in bed with you? You should!